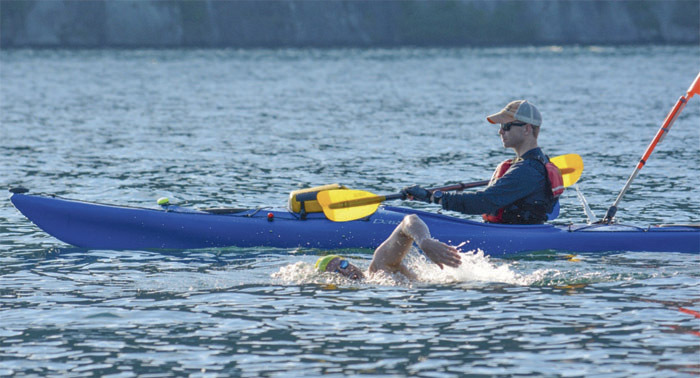 David Dammerman swam the 32-mile length of Lake George, north to south, in what is thought to be record time this past weekend as a lead-up to the Lake George Marathon Swim planned for Sept. 17-18. “It was certainly by far the hardest swim I’ve ever undertaken,” the 47-year-old from Saratoga told The Chronicle. He’s an experienced distance swimmer, including having swum the Engish Channel. His time Saturday and Sunday swimming from Ticonderoga to the Village of Lake George was 18:54:22. That’s a new record, said Robert Singer, an organizer of the September marathon swim. He said it eclipsed the old record of 20 hours and 23 minutes set by John Freihofer in 1981. Actually, two people attempted the swim on June 18-19. The second swimmer, who’s not being publicly identified, didn’t finish. “Lake George doesn’t give up its miles easily,” Mr. Singer said. He said, “It just didn’t come together” for the second swimmer this time. Mr. Dammerman said, “It was long, and at the end I could feel myself slowing down, and all of the islands I recognized just weren’t getting any closer…. “It seemed to take forever to get to Dome Island out of the Narrows, and then I still knew I had another nine miles, which on a good day is a four-hour swim starting fresh…. Besides the distance, there was also a “strange chop” that made it difficult to get a good rhythm going, Mr. Dammerman said. In the cold water of the Narrows, he said, it seemed like he couldn’t swim fast enough to generate enough internal heat. 89 swimmers signed up for Sept.
Mr. Dammerman’s swim was part of a practice run for the Lake George Marathon Swim planned for Sept. 17 and 18. Mr. Dammerman is one of the event directors. “Hopefully, we learned a little bit about navigating at night with swimmers and kayakers,” he said. The September marathon has 89 swimmers signed up — 14 who will attempt to swim the full length of Lake George individually and 14 relay teams of three to six people — plus about 200 volunteers and 33 boats, Mr. Singer said. He said a fast relay team might finish the Lake George swim in as little as 13 hours, while he expects to pull some swimmers out after the event’s 24-hour time limit. Mr. Singer said that virtually all the coordinators and senior volunteers for the marathon were present for the practice run, whose purpose was to smooth out procedures for the main event. He said the organizers have experience with swim events, but “we learned a lot” — like the difficulties of navigating in The Narrows when you’re low in the water, the need to tighten up the handoffs between the kayakers who paddle along with the swimmers, and maintaining communications between kayakers and support boats. A repeat of the marathon in 2007 swam in the opposite direction, from the Village of Lake George to Hague. The most celebrated distance swim came in 1958 when single mom Diane Struble swam the lake’s length, drawing throngs of people and massive publicity. Mr. Singer said the idea for this year’s marathon weekend came when he attended a talk by Diane Struble’s daughter Gwenne Rippon at the Lake George Historical Association last August. The Chronicle reported his remark, which he said somehow got copied onto the Marathon Swimmers Federation website. He said organizers thought Mr. Dammerman would have an even faster time based on other distance swims he’s done. “This is a marathon. It’s an extremely difficult, arduous thing they were attempting,” Mr. Singer said. At the 11-mile mark, he said Mr. Dammerman commented that he still had an English Channel worth of swimming to go. With five miles to go, Mr. Dammerman was very tired and starting to feel cold in the 68-degree water, but he could see the Village of Lake George ahead and “just soldiered on,” said Mr. Singer. Mr. Dammerman said he grew up in Monroe, Ct. He said he got out of swimming for about 18 years after college, but then became involved with a group of swimmers in Saratoga, just to get in shape. Mr. Dammerman said, “I just kept looking for the next challenge — a one-mile swim, a two-mile swim, a 10-mile swim, a 25-mile swim, and then the English Channel.” The Channel is 21 miles, but the water is a lot colder than his other swims. Mr. Singer notes that Mr. Dammerman also holds the record for the “Search for Memphre” 25-mile swim on Lake Memphremagog in Vermont. Mr. Dammerman said he, too, got the idea of swimming the length of Lake George during last summer’s celebration of Diane Struble’s 1958 swim of the lake. In September Mr. Dammerman said he will be one of the directors of the marathon event, rather than making the swim again. Mr. Singer’s wife, Deb Roberts, will be the referee and timekeeper. Mr. Singer said a public forum on marathon swimming is planned for 3 p.m. on Sept. 16 at the Lake George Historical Association. Three world-class swimmers including former Glens Falls YMCA Gator Alex Meyer, who went on to become an Olympic 10K swimmer and 15K world champion will be on hand. A dinner cruise open to the public follows at 4:30 on the cruise boat Adirondac. Copyright © 2016 Lone Oak Publishing Co., Inc. All Rights Reserved.